What if you were rushing to work in a heavy snowed town? What would the best transport mean choice to get ther in time? 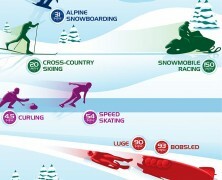 This infographic give us all the speed details as far the various winter sports putting them against a traditional car.